It’s been five days since I posted my initial review of Highrise, that shiny new application by our friends at 37signals. I’ve been getting adjusted to my new process of managing contacts and have had to remind myself a few times that there is a brand new tool that aims to make my life a little easier. I haven’t heard about a Highrise API available yet, but I will definitely be looking into tighter integration once that is available. It seems that Highrise isn’t going to allow direct emails to be sent to it, they need to come from an existing contact in your account. 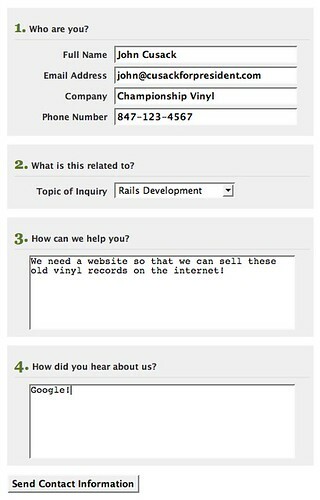 For example, our contact form sends an email to our customer service mailing list. At one point, we had it connected to the Basecamp API to submit each new contact request as a new message in a designated project, but it didn’t really give me what I was looking for. Since each user in Highrise has a custom dropbox email address, I thought that I would try to link up the contact form to submit directly to Highrise. Hi Robby- An email was sent to your Highrise dropbox from john@cusackforpresident.com. This address does not correspond to any address that you have recorded for yourself in your Highrise account, and so the email was discarded. So, in the meantime, I’m following this process with new contact requests as well as the other people at PA who are responsible for responding to Contact Requests. 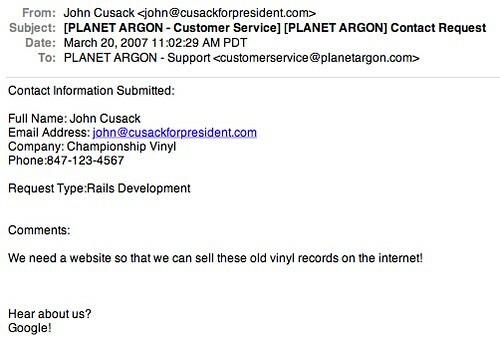 So… let’s say that John Cusack (one of my favorite actors while growing up) is having a weird dream and wants to get a website built for the record store that he ran in High Fidelity. He fills out the form and submits it, which our application than stores and also sends over his contact information to our customer service email address. 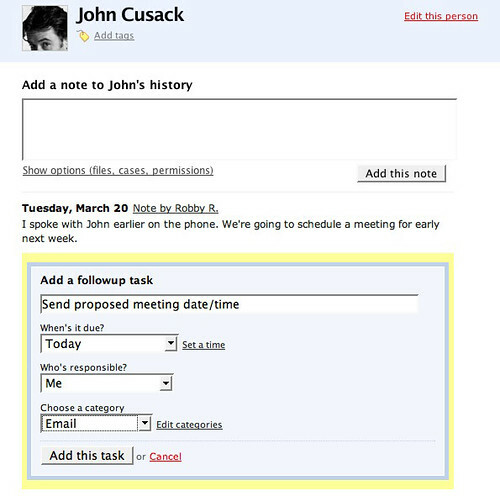 Here I am in Mail.app and doing a double-take… “is that the real John Cusack?” (no, it’s just test data). Can I answer this in less than 2 minutes? Okay, so I’ve decided to forward this contact to Highrise as I decided to go ahead and speak with John over the phone, since he was kind enough to leave his phone number. As I mentioned in my last post, I’m using Act-On for forwarding emails to Highrise. ...and off the email goes. I’m now logged into Highrise and looking at my dashboard. As you can see, John Cusack is now at the top of my dashboad and waiting for me to decide if I want to do something with it. As I mentioned, I spoke with John over the phone and promised him that I’d send him a follow up email with a proposed date/time for a meeting next week. ...and that’s one way that I’m now using Highrise to getting all my contacts organized. We also upgraded to a paying account and paid for invoice #4.... and I plan to hit contact #200 later today within our account. Also… it appears that 37signals has opened the doors to the public earlier today.